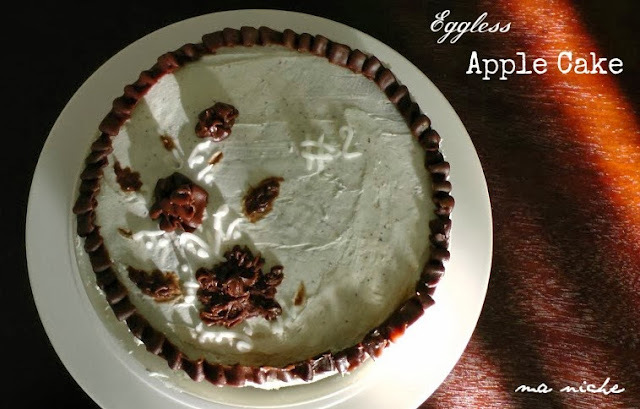 This week I baked an eggless apple cake following yet again a recipe from Madhuram's Eggless Cooking. As always her instructions were flawless. but this time I felt that the cake would taste slightly more moist with an extra helping of fat or oil substitute. so i modified the recipe accordingly. now the picture and the recipe. i preheated the oven to 350 degree F, lightly greased and floured a 9x1.5 inch circular cake pan. For the cake batter, I began by sifting all the dry ingredients together and keeping the mixture aside. next in a microwave safe big enough container, i put the butter and sugar and microwaved it for 30 seconds till the butter was soft. then adding applesauce and the rest of the wet ingredients to it, i beat the mixture till it was smooth. i then folded in the dry ingredients and the apple pieces into the wet mixture, adding them alternatively a little bit at a time till the batter was smooth. then pouring the batter into the prepared pan i baked it for 35 minutes, i.e until a toothpick inserted in the center of the cake came out clean. after letting the cake cool for over an hour i frosted it using Duncan Hines Creamy Homestyle Classic Vanilla frosting and i piped using Wilton's Ready to Use Decorating Icing Tube. For the rippled border and the smaller flowers(I know they are not perfect... nevertheless i call them so..) I used Wilton's 104 tip and this tutorial that i found on youtube. Of course turning the cake around wasn't as easy as turning the cupcake. but it helped to put the cake on a quarter plate and turn that around. Hi Tanu, your apple cake look very pretty. Nice decoration. Thanks Amelie. Coming from you, it means a lot. lately i am become a big fan of your decorations and presentations. Hi Tanu, glad that to know that you enjoyed my decoration and presentation. I appreciate it very much.Usually I spent about 1 to 2 hours set up the display, presentation and photography session. Take up a lots of time but I'm enjoying it. Glad we meet in cyberworld. Your efforts are clearly reflected in the blog. really glad that i stumbled upon it.